pun.org is the ancestral domain of Joshua R. Poulson (“Josh Poulson” when I'm less formal), an Internet inhabitant from the mid-1980's onward. It is the hope of the webmaster that people will enjoy their stopover here, and can make use of the web pages herein. I'm married to this lovely lady, named Misty. 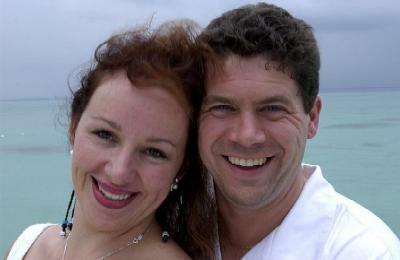 We got married in Cozumel, Mexico in 2003 while on a cruise through the western Caribbean. Son and daughter Ryan and Alana got to go with us. Alana was very interested in the dress. Ryan was very interested in burying dinosaurs in the sand. We've moved Josh's biographical information here. Misty is a nurse (BSN) who works at the Southwest Medical Center Emergency Department in Vancouver, Washington. We keep plenty busy with 13-year-old Alana and 10-year-old Ryan. We are a little outside the hustle and bustle of the Portland metropolitan area, north of a town called Ridgefield, Washington. Puns are described by Merriam-Webster with this particular boring definition: “the usually humorous use of a word in such a way as to suggest two or more of its meanings or the meaning of another word similar in sound.” How droll. If you are looking for puns that I have collected, there are a few here, but I judge that I've not done justice to the subject, and I've left everyone hanging. I do most of my puns in person, on the fly, pretty much winging it. I've been meaning to start gathering my lists of emailed puns into the collection, but there have always been issues with copyrights, either real or imagined. I got my start with puns at a tender early age working my way up to collecting the huge collection stories. I still love to rattle off quick puns and I've been through my share of contests. I owe my love of puns to the influence of my family, which was further enhanced by a Christmas gift from my father in the 1970's… Crosbie's Dictionary of Puns. This is a short “hot list” of the places I visit every day on the web. Many of the blogs I read I get through RSS feeds so I no longer list them here. If it doesn't have a reasonable RSS feed, though, I have to have a link somewhere. First of all, I tend to get most of my browsing from Google Reader, rather than going to a lot of sites directly. Audible.com used to deliver my Harvard Management Update, but I sure miss my PDF hardcopy. Now I don't even get it through Audible anymore. These other ones I used to visit, but now not so much. I have reduced this list to the sources that are useful more often than the other links I used to provide. These sites don't get updated as frequently as the ones above, or I never have the time to browse through them like I do on the weekend. I developed the look and feel of this web site on my own time, but I have indeed used previous designs elsewhere at nratraining.com and nwsafe.org. I have to admit that I have a hobby that involves guns, and training other people how to use them effectively, which seems to annoy certain short-sighted (or bigoted) people. This is bold. This is strong. This is italic. And this is emphasized. At this point Mozilla and Opera are the best things going for the world at large. They pay more than lip service to the standards bodies that drive the web. In fact, they do more than sit on the committees that make the standards that one particular browser manufacturer likes to ignore. I test my web pages with Firefox 2.0 and Internet Explorer 7. There's no valid reason to be using anything older than these, and I still support the use of Opera, because even if you live on a dialup line in the middle of nowhere, better standards support will make the web faster for you! I used to have satellite Internet so I know how important speed is out there. pun.org is currently hosted by Dreamhost. Before I cratered their bandwidth, I was hosted at CGI101.com—a web site business from the same web mind that brought out the book CGI Programming 101 and the sequel, CGI Programming 201. We go way back in the business, to when I was encouraging people to learn Perl and she was dreaming of being an artist.